Manufactured by: Reel Time Images Inc.
On command, those who have joined a hypnotist on stage seem to enter into another reality. But it's hard to believe it's anything more than play acting. Many researchers believe hypnosis can allow us access to hidden memories, help us overcome phobias and be used to manage pain? 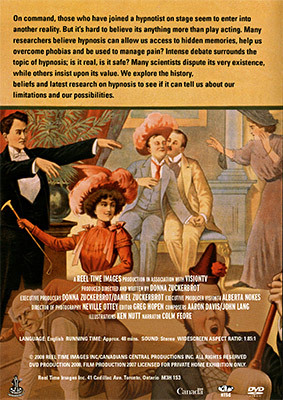 Intense debate surrounds the topic of hypnosis; is it real, is it safe? Many scientists dispute its very existence, while others insist upon its value. We explore the history, beliefs and latest research on hypnosis to see if it can tell us about our limitations and our possibilities.